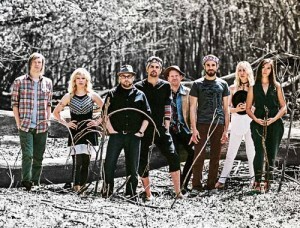 Cloud Cult developed in 1995 as a solo studio project of Craig Minowa. His first full length album, “The Shade Project” caught the interest of a few small independent labels who urged Minowa to consider performing the songs live. Craig worked the next four years on a new studio project which would be the first official Cloud Cult album, “Who Killed Puck?”. Sarah Young appeared on this album for the first time on cello and Eduardo Vaz assisted with drums on a few of the songs. Minowa’s early work earned Cloud Cult several offers from record labels, but all were rejected in favor of self-publishing and maintaining total control over the ethical aspects of the business practices.